At the 11th hour of the 11th day of the 11th month of 1918, for the first time in over four years, the guns fell silent across the trenches that scarred the face of Europe during the First World War. America had been latecomers to the conflict, but at a tremendous cost had tipped the scales in what had been a murderous stalemate. No division had sacrificed more than the 42nd Division, nicknamed the “Rainbow Division ,” as it had been formed from National Guard Units whose origins streached across the country. No unit in the Rainbow Division fought on more fronts, nor suffered more casualties, than the regiment that represented the green in that rainbow: the 165th, the federal number assigned to the 69th New York. It was the same 69th that fifty years earlier as a unit of the Irish Brigade had been given the nickname of “the fighting 69th” as a tribute of respect by an enemy commander, Robert E. Lee. While the regimental number had changed, the unit and the New York Irish would once again prove worthy of that title, and no one was more responsible for the regiments unequaled record in WW I than Col. William “Wild Bill” Donovan. Even before the war William Joseph Donovan was a hero of Horatio Alger proportions. The grandson of immigrants from Skibbereen, Co Cork, he had literally been born on the wrong side of the tracks in Buffalo, New York. Yet, as typical of Irish immigrants, each generation was climbing the long ladder of the American dream. While Donovan’s grandfather had worked shoveling grain in the holds of ships, his father had risen to the influential position of yardmaster for the local railroad. Young William Donovan continued the trend, attending Columbia University where he would earn a law degree. Donovan was a star quarterback of the Columbia football team, where he earned the name “Wild Bill” in an age where amateur athletes were treated like today’s professional superstars. He returned to Buffalo, started a law practice and married the daughter of the wealthiest man in Buffalo. Donovan was not a man to rest on his success; his strong sense of duty and patriotism called him to seek an opportunity to serve his country. With several friends, Donovan formed a National Guard company of cavalry that served when the Army was mobilized to hunt for Pancho Villa. When the United States entered World War I, Donovan was called back to service and assigned as a major to the 165th regiment. He was a popular choice with the mostly Irish American regiment, particularly their Chaplin, Fr. Francis Duffy who would go on to fame and honor in his own right with the regiment. Donovan applied the same tough discipline on his men in training as he had applied to himself as an athlete at Columbia, training his men would learn to appreciate on the battlefields of France. At the river Ourcq, nicknamed by the Irish of the 165th “the O’Rourke,” the 42nd Division had been ordered to cross the river and secure a ridge and farm on the other side. The position was believed to be “lightly held” when in fact they were being faced by three German Divisions including one of elite Prussian Guards. Only the 165th managed to reach its objective, the units on the left and right having fallen back. The result was the 165th was cut off and subjected to machine gun and artillery fire on three sides. It was estimated that the Germans had one machine gun for each four of Donovan’s men. Donovan and his men held their position for three days, until the rest of the Division could reinforce the 165th but at a terrible cost: of 3,000 men 1,750 men and 66 officers were lost. Donovan himself was exposed to poison gas and wounded, yet still continued to lead his men. In one case Donovan, without regard to danger, crossed open ground under heavy enemy fire to communicated coordinates for support artillery. For this action Donovan was awarded the Distinguished Service Cross and promoted Lt. Colonel. Tragically, these circumstances repeated themselves only a few months later when the 165th was asked to breach a line of German fortifications. Again the 165th was going up against some of the best troops Germany had, but this time the 165th did not have the hardened veterans that Donovan had trained and had been lost at the Ourcq, but young and inexperienced recruits. Describing it as foolish but necessary to his wife in a letter written before the battle, Donovan put on his full regulation uniform and insignia. He knew that by being so obviously a senior officer he would be a target for German snipers, but also knew that his men needed to see him and he needed to be in front of them. During the German attack, he was severely wounded, but continued to encourage his men refusing all attempts to evacuate him till the battle was over. 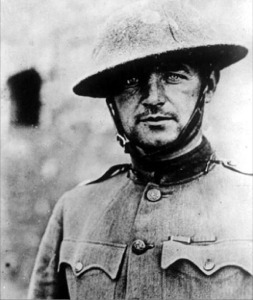 For this Donovan was awarded the Medal of Honor and became the most decorated soldier of WW I.